From the moment you step into the spacious foyer, you will feel swept away by the elegant South Seas decor of this home. The chef in the party will enjoy the fully equipped kitchen. Master suite is fit for royalty with lavish decor and plush appointments. The split floor plan is perfect for couples traveling together or to give kids their own space. Each room offers Flat panel televisions. Outside, you have a spacious screen patio overlooking the golf course. Perfect for visiting or spending a quiet afternoon reading a good novel. Just steps for the water's edge, Tivoli by the Sea is one of Sandestin's most popular vacation condos. Guest Book Comments: We can't thank you enough for letting us stay at your condo. It is truly a paradise. We are so happy that you bought this great place! Your condo is beautiful, clean and comfortable with a great location. Thanks for letting us stay in your condo, it was so much more than we expected. You have truly developed a paradise to escapte to. We are very thankful to have used your home. Guest Book Comments: You have a beautiful very comfortable place. We greatly appreciate the use of the beach toys, chairs, coolers and towels. Your condo was perfect for our family of five. Thanks for having towels, chairs and umbrella, etc. Well the girls have pretty much said it all!!! This place is so luxurious and let us feel like we are truly 'living large' for a week. Back again two years later, love the improvements and beauitful touches you have added. Guest Book Comments: Thank you so much for letting us use your condo. It is probably the nicest place we have ever stayed, we had a great time. Your condo is beautiful, well furnished and so convenient to everything. job of making the condo feel luxurious as well as homey. My husband and me fell in love with Destin years ago and decided to purchase our second home in the Sandestin Golf and Beach Resort. We choose this resort because it offered so many amenties for our family and guest. It is very secure, sidewalks throughout the property and just a fun place to vacation. This property is professionally decorated, very upscale but offers the comfort of home. I have many guest come back year after year because they enjoy the location, it is very clean, and I offer different amenties that the typical rental does not. You will fall in love with my condo just like I did and want to return each year. I fell in love with my condo because of the floor plan which has split bedrooms, ideal for guest you may travel with, children or in-laws. Great location, near the beach and first floor on golf course. You will love it too! Shampoo and body wash provided, hair dryer in both baths and curling iron. Fully equipped, coffee pot, blender, pots/pans, silverware, plates, etc. This condo unit provides all the luxury of home away from home. Very comfortable and guest come back year after year because of the aminities this owners offers and the clean condition of the unit. Large closet provides beach toys for children. Having never been to destin or the surrounding areas it was a bit of a shot in the dark as to the where the best place to stay was. Sandestin didn’t disappoint!! Close to lots of things, the beach was a short walk away which was absolutely stunning. I don’t play golf but wish I did as the course is gorgeous. The condo was perfect. Absolutely spotless when we arrived and was overly stocked with all your home comforts when your away from home. Sharon was super quick to respond with any questions I had and I will definitely out this in my back pocket for somewhere to return too. We have fallen in love with the emerald coast and everything that is offers. Would highly recommend staying at the condo. Thanks Sharon! We all enjoyed our stay despite a few rainy days. So much to do in the area. The condo was furnished nicely and very comfortable. There are great walking paths and there is easy access to the beach. We weren’t forced into a full week which was a win for our crew! Hope to rent again next fall. We have vacationed at Sandestin for over 30 years, and this condo was by far our favorite. Everything is exactly as pictured and was very comfortable. To be able to take our miniature Schnauzer was an added bonus. The owner did an exceptional job in providing unexpected items such as shampoo and conditioner is each bathroom and hand soap. We also really enjoyed the screened porch with very comfortable furniture. I certainly hope this condo is available when we make our plans for our next visit to Sandestin. Truly outstanding! What an amazing place to just kick back, recoop, + enjoy some relaxation! My mom + I had the best time! We loved the place. It was some comfy and relaxing. Felt just like home. Will definitely be coming back and staying again. Everyone there was super friendly. Great places to shop and good places to eat. Just a great place to get away and relax. Thank you for letting us stay there and enjoy ourselves. the condo was beautiful and well stocked, great location, felt safe and secure, beds comfortable, pillows comfortable. Owner very helpful. Tivoli by the Sea is the of my condo and is equipped with upgraded amenties for your enjoyment. Beach chairs and umbrells are provide to save you weekly rental rates. Tivoli has its own pool which is about 200 yards from the front door. The condo is located on the beach side of the Sandestin Resort, directly behind the high-rises. It is not on the beach, but a short 8 minute walk will get you there! Screened in porch sits on the fabulous Baytowne Golf Course. You will enjoy the luxury feel of the condo, but the comforts of home. Videos and games are provided for your enjoyment or for those rainy days that Florida is known for. If you are a walker or a jogger, the resort offers sidewalks throughout. A tunnel takes you under the highway to the bay side of the resort on your way to the fabulous Baytowne Wharf which has many great places to dine and lots of fun activities for adults and children. A playground awaits the children, that was designed by children - an absolute great place for the children to play while sipping on your favorite refreshment. Dinning offers pizza, oysters to up-scale five star restuarants. You will be impressed with the condo and resort, so book your vacation today! $600 deposit is required within 5 days to secure your vacation. Rates posted includes all Florida Taxes but must add $150 for cleaning fee and $100 for small pet fee, if applicable. Golf Cart not included in rental, but have contact to offer a golf cart exclusively for my unit. Please contact owner for rate details for long term. We welcome snowbirds and offer reduced rates for month long rental. 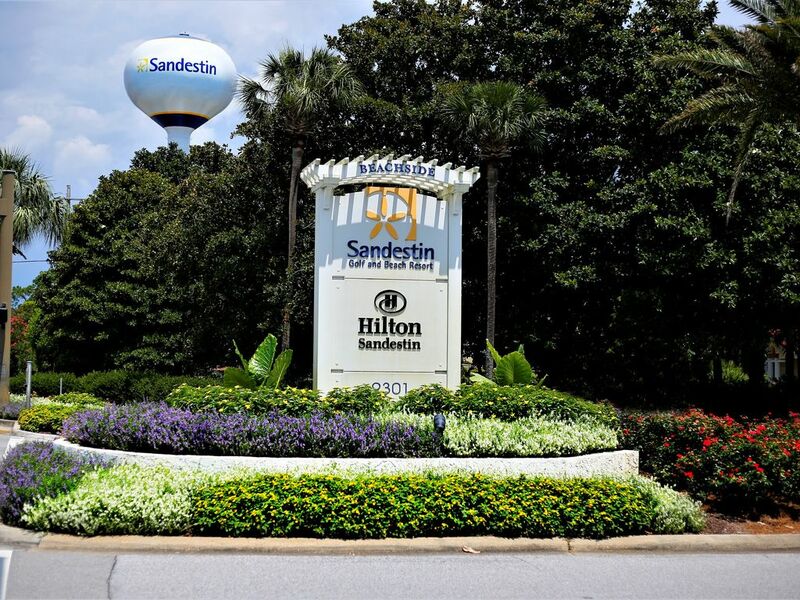 The Sandestin Golf and Beach Resort is a fabulous vacation place for families. It is very secured for children on the property. You will not find a better place to vacation plus at a very reasonable rate.